'Veil The World'... Seeing as space-time is but the Veil of Maya, they draw a veil over the Veil of Illusion like a cosmic Christo wrapping the All in pink fabric as an artistic statement. This is the Id clawing up the bunker wall, seeking purchase and a way out. The atmosphere is claustrophobic, or rather, claustrophilic. Enter the ritual and open up to the consciousness of the cold, dispassionate cosmos through the fresh hole in the prison that is your skull. Opening proceedings is 'Cherem', which means shunning or excommunication. The stage of the opening of the eyes in a shamanic sense that requires being rejected by the herd. This is the left hand path, vision that sees beyond social conditioning and obligation. To begin upon the path one must become as a shadow to the world of mammon and illusion. This track takes the appropriate form of a drone and an obscure recitation. There is something refreshing in the old school industrial beat and distorto-vox of the title track. A minimal number of sonic elements, the vocals panned left and right in a looping litany come together to re-tune the listener's brain waves. Now, skull open to thee 'Aethyrs', neural activity attuned, it's on to the elevator to 'Avgrunden', which could well be a simple field recording of the elevator ride to the abyss. Once there we come face to face with the 'Lightbringer'. Breathe in his malevolence and sway to his pulse in a tonglen meditation of doom. Upon exhalation you take the cup, get 'Drunk With Blood'. Now you may put your questions of life, death and eternity before the council of the dead. But through the process of 'Nekyia', there will be no returning to this world with the answers. You will emerge in the next universe over in a new form. 'Akeldama', the Field Of Blood, here is from whence we hear the sound of Judas Iscariot spilling his innards in the clay. That clay was later dug up and taken away to make sarcophagi for the faithful dead. According to Acts, Akeldama was bought by Judas with his 30 pieces of silver, though according to the gospel of Matthew, Judas returned the money and it was used to buy the field of Akeldama to be used as a necropolis for foreigners. The blood in the field is in a theological quantum state, sangre de Shrödinger, simultaneously blood of Judas and blood of the Lamb, until it is drunk and transubstantiated to one or the other. Trepaneringsritualen conduct a ritual reliving of this duality of pain. 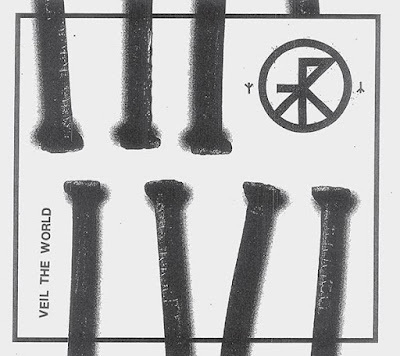 Trepaneringsritualen's cover of Death In June's pomo nod & wink totalitarianan chant 'C'est Un Reve' seems less to pose the question Où est Klaus Barbie but more like it answers the question Où est Jonathan Briley, or at least the spirit of Jonathan Briley. Much of the aesthetic of Trepaneringsritualen evokes the filthy art of early industrial, and this track brings to mind Mr. Briley's pre-Sleep Chamber tape experiments. Où est Malibu Barbie? Où est G.I. Joe? Liberté - C'est un rêve. One can't read an artist's mind when listening to an album, but the placement of this cover after all the occult and spiritual references that preceded this track acts like a coda depicting the fruitlessness and banal evil that can be made possible only by those who stayed put within the confines of society.